Compassion is proudly Christ-centred and church-based—and actively helping children of all creeds and faiths. If Compassion’s program and all its local church partners were only open to Christians, Qeisha—and thousands like her around the world — would have missed out on the opportunity to learn, play and develop to meet her potential. You see, Qeisha was raised in a Muslim family living in poverty. But because of the local church’s open doors, Qeisha and her parents, Ruslan and Saadah, feel they are part of the church family, not only because she attends the program, but because they are always accepted by the staff and church members. “All tutors and people in the church consider us as family,” says Saadah. 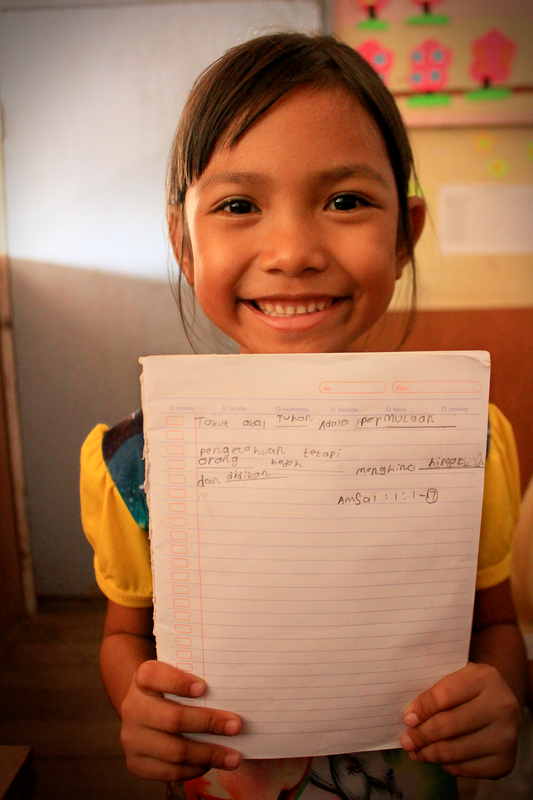 At Qeisha’s child development centre, in East Indonesia, she’s not the only one. There are 181 children registered; three are Muslim, 110 are Buddhist and 68 are from Christian families. All are welcome. In fact, Christians are very much a minority group in her community. The population is (roughly) 75 per cent Muslim, 12 per cent Buddhist, six per cent Catholic and five per cent Protestant, with 1.5 per cent of the population professing other religions (or none). Her local church and the workers at the child development centre purposefully open their doors to children and families of all religions and backgrounds, and go out into the community with the message of God’s love. “Every year on religious holidays, all staff and tutors visit and greet each child and their families at home. It’s happened since 2013,” said Dina, the project coordinator. They hope to not only tell children that God loves them, but show them through the practical support that you—and thousands of sponsors like you—provide. Qeisha’s family is part of a predominantly Muslim tribe. Some of their friends and neighbours initially resisted the construction of a Christian church. But slowly, as the influence of the church and the Compassion program became clear, that opposition turned into curiosity. “I didn’t care what people said as long as I know what my daughter learns and receives at the project are good things and those things are proven,” says Ruslan, Qeisha’s father. Even though most of the families are not believers, 70 per cent of children at Qeisha’s project attend Sunday school every week; their parents drop them off and pick them up at the church. The children’s parents sign a consent form when their children are registered with the program. The form states that the parents agree to and accept all rules at the project, including the fact that they will participate in Bible-based lessons. Qeisha’s parents actively join in church life and are involved in the program activities. Saadah accompanies her daughter to the centre and Ruslan always helps with church construction projects when he’s asked. Compassion partners with local churches to help children who are living in poverty, regardless of their class, creed or religion. As children gradually build their skills, overcome their circumstances and see God’s love in their lives, their hearts are changed. For Qeisha’s church pastor, Djonly, that change will ideally have a significant impact on the children’s families—and the wider community. “Let all the glory be to God, who used us to help people … through their children. We hope that Qeisha’s [parents] and others will see Christ through their children’s transformation,” says Djonly.